If the pretty still picture turns into a black box when you click on it, you don't have a quicktime movie viewer on your computer. You can try this other movie type, but it is a much bigger file and will be slow to download. You will probably have to open windows media player to view it. 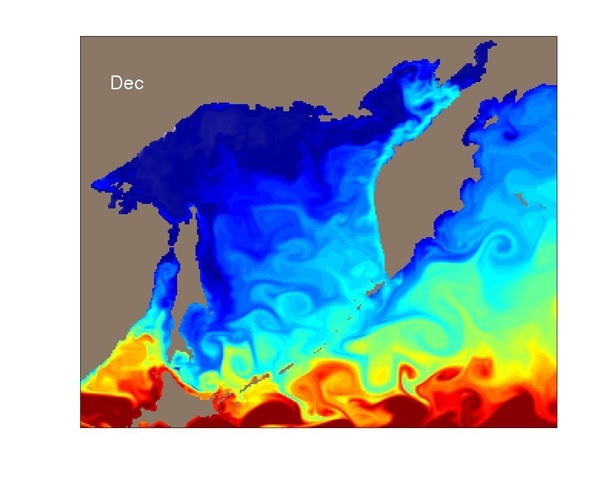 The color shows ocean temperature with red being about 10 degrees Celsius and blue about 0. The sea ice fractional coverage is shown in white, as you might guess with bright white being fully covered. The animation shows a random year in a long model run that is not tied to any particular year in nature. Climate models generate "weather" that is out of sync with nature's weather because of the famous butterfy effect. The time a model can predict weather is only about 2 weeks. This model was run for 150 years, so we don't even bother to try to predict real weather. Setting the greenhouse gas and aerosol levels is the ways we can "dial-up" a particular time. This model has year 2000 levels. The model sea ice in the northern hemisphere is biased low and the hemisphere is also biased warm compared to the present climate. Normally we would adjust some paremters in the cloud scheme to tune the model a bit to reduce theses biases. This model was run at very high resolution and tuning it would be very costly. Thus we settled for these biases. Cecilia Bitz made these animations from integrations made by the PetaApps Modeling Team. The original members of the PetaApps team are supported by the NSF Office of Cyberinfrastructures. They have since adopted several members, including Cecilia. Computing was done on Kraken at the National Institute for Computational Science through a computing grant on the TeraGrid, which is also funded by NSF.